If you can't see why The Invisible Man slot game is the perfect spinner for players of all persuasions, let us show you. This sinister slot from NetEnt is packed with lucrative free spins, merging wilds and jackpots worth up to 500x your bet. 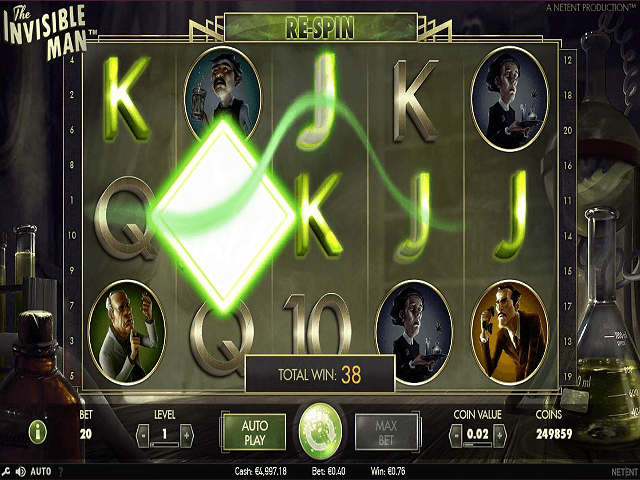 It's the creepy result of a high-profile collaboration between NetEnt and Universal Studios, delivering a hair-raising, high-stakes slot that's based on the 1933 horror classic movie inspired by H G Wells. Ready to unwrap the mystery? Read on for your guide to The Invisible Man and his lucrative bonuses. 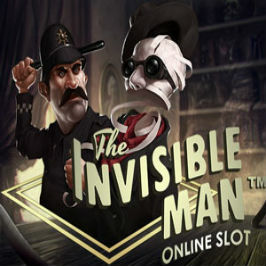 Play The Invisible Man Slot Demo for Free! Play The Invisible Man for Real Money! Before you even get to see the five reels, three rows and 20 paylines of The Invisible Man slot game, you'll be treated to a silver screen-quality intro. Designed to set the story and immerse you in the game, the opening video is a great touch by the development team at NetEnt. But this isn't where the story ends. In an effort to recreate the story of The Invisible Man, the designers have filled the interface with characters, animations and impressive sound effects. The reels and everything around them are cast in a gloomy shadow, with each cartoon character looking as though they've been plucked from a Tim Burton horror movie. With an eerie backing track, you get a real sense of trepidation as you play. 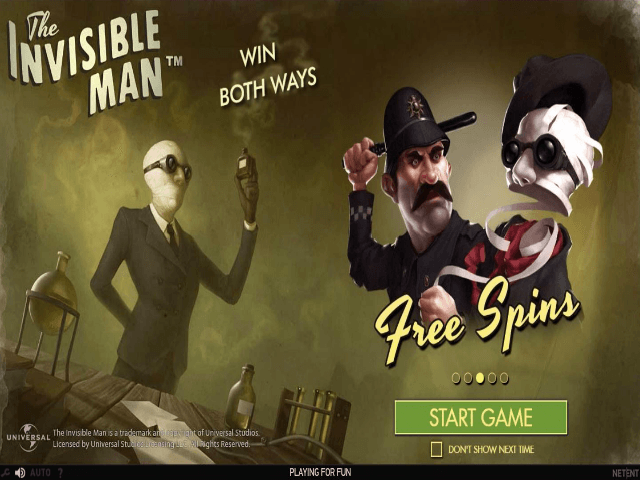 With its thorough theming and attention to detail, The Invisible Man online slot game has to be up there with the most entertaining spinners in the industry. Although the movie link certainly provides some initial appeal, it's the styling and clever use of animations that make players stick around and play for prizes topping 500x their wager. Accessing The Invisible Man's payout table requires the adjustment of two variables: level and coin size. As the number of paylines is fixed at 20, any coin size you choose will automatically be multiplied by this figure. This means that when you move the counter between £0.01 and £0.20, you'll be paying anything from £0.20 to £4 per spin. If these limits aren't enough to get your juices flowing, you can adjust the level and kick things up a notch or ten. By increasing the level, you're effectively adding another coin to a win line, which means you can take the max bet up from £4 to £40. Once you've found the right bet, The Invisible Man's prizes start flowing when you match three or more symbols. 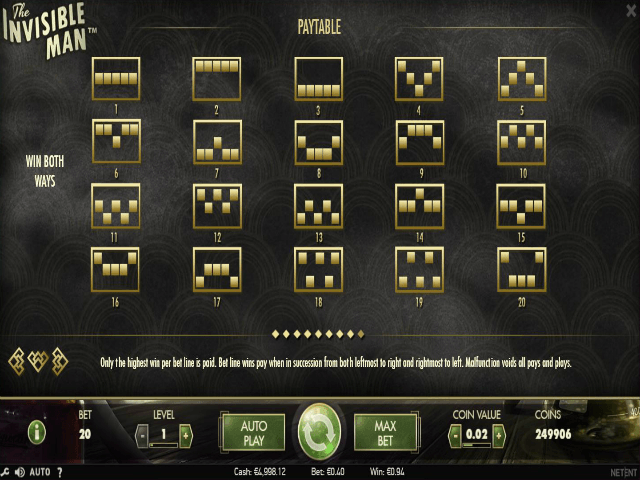 For matching card symbols (10 to A) you can win anything from 2x to 100x your line bet. For higher value symbols such as Mrs Hall, Dr Cranley and Flora Cranley, you can scoop as much as 500x your line bet. In this bonus round, you'll receive three free spins with five random wilds scattered around the reels. This bonus takes you to three different locations. In each location you'll get to uncover mystery prizes, which are then added to your balance at the end of the round. 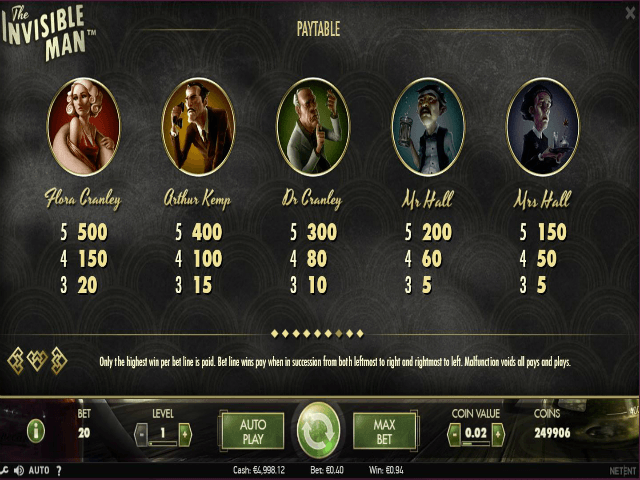 When you take this unique bonus system and combine it with a movie-quality interface that's packed with personality, The Invisible Man slot game is truly impressive. If you're after immersive gameplay and pocket-friendly wins, don't overlook The Invisible Man. Share this The Invisible Man Review today! If you like The Invisible Man, you'll love these slot titles too!